Discovery calls are a cornerstone of online business. It’s how we find our Gwen to our Blake, the peanut butter to our jelly, the perfect cream for our coffee….you get the picture. People really wig out over discovery calls and it is so unnecessary. The drama and stress that we cause ourselves just dooms us for an epic fail. So it’s time to stop that. If you’ve done your due diligence, a discovery call can be fun and result in a sale with very little effort! Let’s discuss some simple ways to make this process a lot less painful for you. Make sure people know that the call is to determine if working together is a good fit and not free coaching BEFORE getting on the phone. You can do this by having a statement in your application and a notation on your discovery call sign up page. You can even have an email sent to people who sign up telling them how the call works and what it’s all about. When you get the person on the phone, remind them that the call is to see if working together is a good fit. Let them know it is informal and no pressure. If either of you isn’t interested in working with the other, you will part as friends. Give them the structure of the call so they know exactly what to expect. If you do an overview of what you feel you can help with followed by time for questions, let them know that is what you are going to do. Give as much value as possible prior to getting people on the phone so working with you is a no-brainer. I cannot express enough that this is where the gold is. The big name coaches attract people like moths to a flame and I can assure you, they are not doing a lot of selling because they don’t have to! People know what those coaches have to offer and you can do the exact same thing. Get yourself on Live. Give and give and give in your Facebook group and other groups. Rock your thing on Instagram. Show them what your mama gave ya. This is a business and you have a solution to their problem and a badass approach to go with it. Show them the road map. Do some pre-prep, look at their website, check out their content, go to their Facebook page, and develop a basic plan for coaching. This way you can give an educated overview of what you suggest working together could look like. Make sure you are asking questions on your application that not only give you an exact feel for what they want but also where you can find them and what they are already doing. Do not push a bad idea. If it’s someone who is going to be bad news for you or you are a horrible fit for them, do not push it. You don’t want it and neither do they. If someone else would be a better fit for them, refer them out. Yes…people do that. I’ve been taught all of the fancy methods for getting the sale on a discovery call. 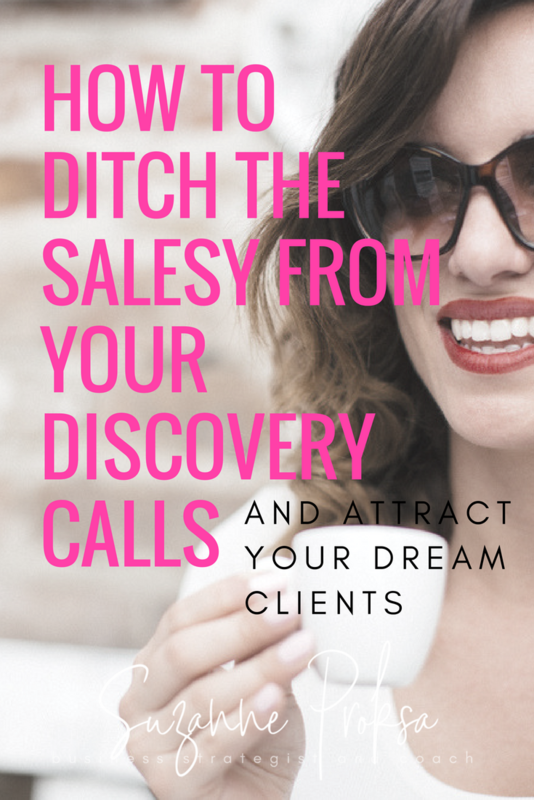 I don’t know about you but I would rather wow them, be clear up front, and have them ask ME how to work with me rather than suffer through common sales tactics. How about you? Ready to look into coaching? Hop over to my coaching page at https://suzanneproksa.com/coaching. Join the FREE SuzCrew for resources and Suzanne’s muses!